Whether the Medical Marijuana Patient Identification Card is carried in your wallet or purse, your Recommendation Number is printed right on the card along with your photo and the 24 hour verification phone number so that you can ALWAYS evidence to law enforcement or anybody else that you are a patient who underwent an evaluation and received a recommendation for the medicinal use of medical marijuana under California Health and Safety Code Section 11362.5 (Prop 215 and SB 420). Many patients have told us horror stories (See Testimonials Below) of being passengers in cars or riding bikes at the park and being stopped by law enforcement who suspected that the patients were in possession and or were medicated. Many patients who were in possession of medical marijuana and were NOT able to evidence proof of being a medical marijuana patient, were either cited and in many cases arrested for possession, which resulted in huge court costs, time consumption to deal with these legal matters and worst of all, it goes on your record. Other patients who DID NOT have their paper recommendation, were able to conveniently and confidently show their Medical Marijuana ID Card and immediately prove to law enforcement that they are legally allowed to possess medical marijuana in accordance with California State Law (Prop 215 and SB 420). Lastly, the Medical Marijuana Patient Identification Card is issued by this doctor’s office. This ID Card is NOT a State or County Identification Card. All of the information that you provide is absolutely 100% PRIVATE and CONFIDENTIAL and is NEVER RELEASED. Your medical records and all information is protected under State of California Patient Privacy Law. 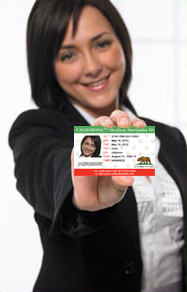 Please take into consideration the VITAL IMPORTANCE of the Medical Marijuana ID Card and the problems that it can save you from when you visit our office for an evaluation. 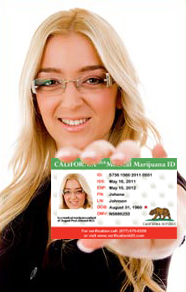 Please feel free to ask our staff for more info about our Medical Marijuana Patient Identification Cards. Lastly, please DO NOT drive medicated or operate heavy machinery. Medicating is best when done in the privacy of your own home. If you are driving and are in possession of medication please make sure that it is in the trunk or as far away from you as possible and in a secure place where the smell is contained as much as possible due to the potency of today’s medication. Patient Jeanine M: I was driving to Irvine and was pulled over. The officer smelled the medication when he came up to my car and told me to immediately step out. After calling for backup and waiting for 4 squad cars to arrive before searching my car, they searched my car inside and out and obviously found my medical marijuana medication as well as other prescription meds because I am 72 years old. I told the officers who were very mean to me that I was a medical marijuana patient. They asked for proof. I said that the only thing I had was my paper recommendation which was in my trunk. They refused to let me go to the trunk to show them that I am a lawful medical marijuana patient. I was almost arrested for possession and was given a ticket. It cost me a huge amount of money that I do not have. It cost me a huge amount of time going to court and worst of all the whole experience was just really scary for me because I have never had legal problems like this in my whole life. He told me that if I could have shown him an medical marijuana ID card that proved that I am a medical marijuana patient, he would NOT have had the legal basis to arrest me or give me a ticket for possession… The next day, I went back to the office and bought the Medical Marijuana Patient ID Card so that I could always prove that I’m a legal medical marijuana patient. Patient Nathan K: I was driving with my friend to a concert. He was driving and was NOT medicated but I was and had medical marijuana in my pocket as I always do because I’m going through chemotherapy treatment for cancer. We were pulled over by CHP on the freeway and he smelled medication immediately. He stepped back and almost pulled out his gun and told us to get out of the car. We got out and while our hands were on our heads, I told him that I was a medical marijuana patient because I already had my Medical Marijuana Patient ID Card in my hand. He looked at the driver who was clearly NOT medicated and then looked at my ID Card. He saw that I had a valid recommendation. His demeanor immediately changed and he even almost apologized to me as he was giving me back the medication which he found after patting me down. He said he felt how skinny I was during the pat down because I lost a huge amount of weight since undergoing chemotherapy and that my license said 225lbs but I was clearly barely 150lbs. He told to make sure that I ALWAYS carry proof of being a legal medical marijuana patient because law enforcement is instructed to cite and sometimes arrest for possession all people who CANNOT PROVE that they are medical marijuana patients. The next week, the driver of the car went to get his recommendation and definitely got the ID card because he saw himself how that saved the day for me. We enjoyed the concert and I had no worries that I was in possession of medical marijuana because I knew that I had the ID Card in my wallet. Patient Cathy B: Thankfully I spent the extra few dollars to get the Medical Marijuana Patient ID card because after getting the recommendation I went to a dispensary to get medication for me back which I severely injured in an accident a few months back. The girl at the dispensary was very nice and helpful but she forgot to put my paper recommendation back into my folder and I left with a bag of meds and went home because I was in a huge amount of pain and discomfort. Right as I was about to turn onto my street I was stopped by police because he said that my tail light was not working. The next thing he said is, ‘Do you have narcotics in your car’. I said NO, just medical marijuana and that I am a patient. He said show me proof. As I opened my folder, I was in horror to find out that the paper recommendation was NOT there. Luckily and thankfully I totally forgot that I had the ID card in my wallet and showed that to the officer. It was very late and he went back to his car to verify that my recommendation was valid and that I was an actual patient. He returned to the car a few minutes later, gave me back my driver’s license, my Medical Marijuana Patient ID Card and the medication and said you are free to go home. He did say that I should ALWAYS medicate at home and NEVER drive while medicated because if you to drive medicated no matter what medication you are taking neither a recommendation nor prescription would save you. If not for the Medical Marijuana Patient ID Card, I would have had huge legal bills and even worse of all it would have gone on my record… Thankfully I spent the extra few dollars to get the Medical Marijuana Patient ID Card when I went for my evaluation. Protect yourself with the Medical Marijuana Patient ID Card and always make sure that you DO NOT drive or operate heavy machinery while medicated. You should preferably medicate in the privacy of your own home.